Definition at line 927 of file MemRegion.h. Definition at line 603 of file MemRegion.cpp. Definition at line 964 of file MemRegion.h. Definition at line 532 of file MemRegion.cpp. Definition at line 949 of file MemRegion.h. 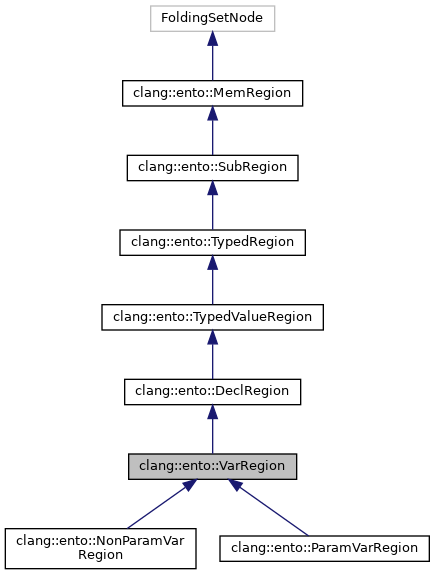 Referenced by clang::ento::retaincountchecker::RetainCountChecker::checkPostStmt(), clang::ento::MemRegionManager::getVarRegion(), clang::ento::ExprEngine::VisitBlockExpr(), and clang::ento::SValExplainer::VisitVarRegion(). Definition at line 157 of file MemRegion.cpp. Definition at line 953 of file MemRegion.h. Definition at line 607 of file MemRegion.cpp. Definition at line 319 of file MemRegion.cpp. Definition at line 928 of file MemRegion.h.